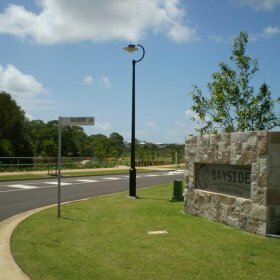 The multi-stage development at Collins Street, Redland Bay, is an 84 lot residential development with a commercial precinct. The layout of the development has been developed such that the natural vegetation and waterway corridor are retained as park area. Lambert & Rehbein have provided services from Development Application through to completion of construction for Stages 1, 3 and 4. Stage 5 design has recently received Operational Works Approval and is about to go to Tender. Stages 1, 3 and 4 incorporated a number of bio-retention swales which treated stormwater runoff prior to discharging into the existing waterway corridor. 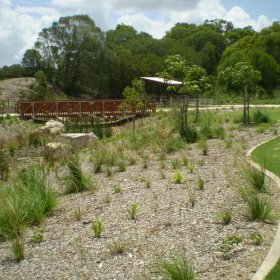 The Stage 5 design also incorporates a bioretention basin and Lambert & Rehbein has worked closely with Redland City Council to provide a feasible design which will provide protection of a large tree in the road reserve area for Stage 5 of the project. Sediment and erosion control plans.